The Ordnance Quick-Firing 17 pounder (or just 17 pdr) was a 76.2 mm (3 inch)gun developed by the United Kingdom during World War II. It was used as an anti-tank gun on its own carriage, as well as equipping a number of British tanks. It was the most effective Allied anti-tank gun of the war. Used with the APDS shot it was capable of defeating all but the thickest armour on German tanks. It was used to 'up-gun' some foreign-built vehicles in British service, notably the Sherman Firefly, giving British tank units the ability to hold their own with their German counterparts. In the anti-tank role it was replaced by the 120 mm BAT recoilless rifle after the war. As a tank gun it was succeeded by the 20 pounder. Due to a shortage of carriages for this gun, many were mounted on 25 pounder carriages. These were known as the 'Pheasant'. The kit has four sprues and a small bag with the two tires in it. Each sprue is individually bagged to prevent damage. The kit is also pretty lonely in the big box in which it comes. You also get two photo etch frets and a section of string. As you might expect, this is not an EZ build kit. 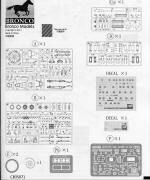 Bronco prides itself on providing a lot of detail with its kits and this one is no exception. Most of the photo etch, for instance, is used for some of the really small parts that includes the various levers used to open and close the breech, bits for the azimuth and elevation controls and many, many more parts. As we've seen in some of their other kits, there are bolt and rivet heads molded onto one of the sprues. These are to be removed and placed on various parts of the kit. This seems a bit much, but the locations on which they'll be placed are areas where mold seams will run through the part and it is much easier to attach a new bolt head than clean up a mold seam going through one. One of the decisions the builder will need to make fairly early in the construction sequence, is whether to build this one in the tow or the firing position. This is particularly true of the carriage as it will require the large firing ring to be either on the ground under the gun or stowed up against the trail. Detailing for the gun itself is superlative. Every item that is on the real one is accurately portrayed in the kit. Everything from the breech to the barrel to the recoil mechanism is there. 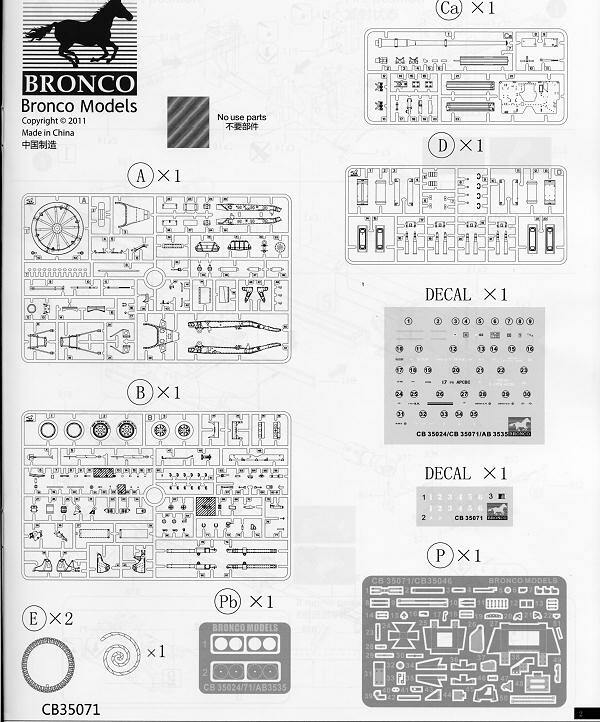 Instructions are the usual Bronco booklet with areas of interest highlighted in color and detail drawings to help locate parts. Color information from a variety of sources is also provided. The decal sheets are pretty much data markings for the included ammunition and ammo boxes. You can either paint your gun in a desert tan as shown on the box art or a field green shade. Sounding somewhat like a broken record, this is yet another superlative and highly detailed kit from Bronco. 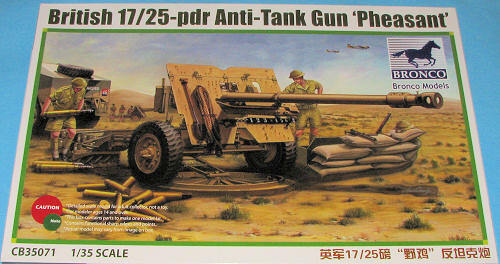 Artillery fans will be delighted with this kit and it will make into a great looking model when it is done.